Over the past two years, Pittsburgh-based artist Kyle Ethan Fischer’s work has found a home at Boxheart Gallery, a small, unassuming space located on a busy section of Penn Avenue in the city’s Bloomfield neighborhood. This month, he unveils his latest exhibition Sea Creatures and Blood Vessels, a collection of works on paper and sculpture that debuts March 6. According to his artist statement, Fischer explores artistic control physically by “mimicking elemental processes like erosion, deposition, combustion, and cooling in his art-making”, which is achieved using various materials like antique needlework, beadwork, chicken-wire, or diagrams of nano-tubes, military weapons and silica. In the past, his original artwork was featured at the first Pittsburgh Visionary Arts Festival in 2009, as well as the Three Rivers Arts Festival: Artist Market that same year. Sea Creatures and Blood Vessels reflects a very personal journey for the artist, as he explores his own real-life open-heart surgery that resulted from what his surgeon described as a vascular system similar to sea creature’s. Fischer uses a palette of cool blues and red that seem to represent blood and arteries as he looks at how the physicality caused his dangerous heart condition to develop. 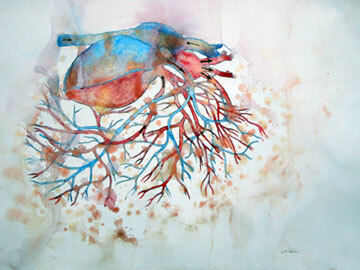 Boxheart will host a reception for the exhibit on March 10 from 5 p.m. to 8 p.m. The event is free and open to the public. Sea Creatures and Blood Vessels will run from March 6 to March 31.